Many have heard about chives only as a supplement in prepared dishes. If that's the case you have missed the enormous benefits of this extraordinary vegetables. Mild smell of onions, small calorific value and abundance of nutrients are the main advantages of this plant. This delicious and delicate bulb is rich in valuable nutrients and offers us numerous health benefits. It protects us from a large number of cardiovascular diseases, improves immunity, strengthens bones, strong vision, facilitates digestion and keeps the brain. In what ways can we use chives in the diet and how it is used in medicinal purposes? Find out bellow. Chives Latin name is Allium schoenoprasun. In Europe it is useful garden plant, which is not too difficult to cultivate. It can be cultivated in open spaces, gardens, as well as in greenhouses. The best period for planting is the end of March, and in June appear first Wisteria blossoms. During the spring you can plant it in the gardens and replant it in autumn. Wild onions tolerate winter and low temperatures, they are resistant and sturdy. It can stand mechanical injury and quickly recovers. The leaves are cut several times a year, and extraordinarily regenerates in the short period of time. In Europe it is becoming increasingly popular in pots and is cultivated on balconies and terraces, as well as the rooms. They need to be watered several times and like that you can have it throughout the year. When it comes to soil it is somewhat more demanding, namely it must be of the highest quality and loose. Add fertilizer at least once per month. In well-drained soil, chives grow quickly and thrive in a very short period of time. It needs to be cut every 20 days. One tablespoon of fresh blades of chives provides three percent of the daily requirement for vitamins A and C. It contains significant amounts of vitamin K, calcium, magnesium, phosphorus and potassium. Most often it is used as a spice and is added to cooked dishes and soups. Vitamin B8 (choline), is an essential nutrient that affects brain development in the fetus. It improves memory and intellectual abilities in adults. This substance, namely, helps to create myelin - the protective film of the brain and nerve cells. In addition, it is important to maintain heart health because it lowers LDL cholesterol. Thanks to this vitamin it reduces the deposition of fatty substances in arterial walls. The wild chives relaxes blood vessels and lowers blood pressure. Choline participates in the transfer of nerve impulses, and secretion of dopamine, relaxes the nerves and muscles. To a large extent, help in case of insomnia, mild neuralgia, and depression. Similar effect on the nervous system has a folic acid - vitamin B9, which also abounds in delicious shallot. Wild onions contain lutein and zeaxanthin, compounds whose antioxidant effects are most effective in protecting the eyes. Specifically, these substances delay the development of cataracts and protect eyesight. Therefore, chives are recommended to all those who have a family history and propensity gray network of visual impairment. Also, it keeps under control eye pressure. If you have problems with constipation, irregular and hard stool be sure to include it in your diet. It will improve digestion and facilitate regular emptying of bowels. It also has antibacterial properties and does not allow for the accumulation of bacteria in the intestines. Wild chives will help those who have problems with gases, so regularly add it in soups and stews. 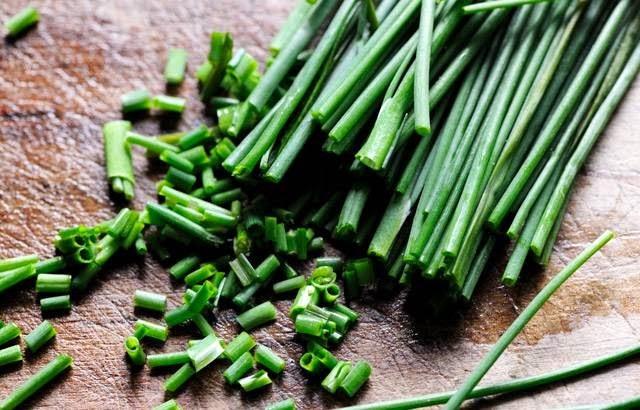 Nutrients from chives are mainly allicin and quercetin, provide a wealth of health benefits, including the prevention of various forms of cancer. Researchers who have studied the vegetables from the family of the arches, and the shallot, connect it to the reduced risk of cancer. Especially gastric cancer and colon cancer, and prostate cancer. Allicin also has antibacterial, antifungal and antiviral properties. So therefore it is often used in anti-parasitic programs when it comes to feeding youngsters infected with child's worms. The mild flavor of wild onions goes well with many foods, especially eggs and soft cheese. Therefore, it can be used in the most versatile combinations. Of course, chives potato salad is something you definitely need to try. It gives a spicy note to almost every dish: soup, omelets, sauces, homemade pie. Shallot spice became part of a larger number of spice blends and fits them great. It goes nicely with parsley and estrogonom, and it is very nice and combined with horseradish. Also, wild onions can be grown as herbs, and are available throughout the year. It is best to use them raw, but in cooked foods it should be added at the end of cooking. In this way it will preserve its delicate taste and texture. When cutting it you should use a sharp knife to cause less damaged to structure full of nutrients. Where to buy fresh plant? Of course you can buy it in the markets, from trusted manufacturers. As soon as you bring it home cut it into small pieces. If you plan to use it the next day, wrap it in a damp cloth and refrigerate. If buy it in the supermarkets, be careful about its freshness. It must have an intense green color. Do not leave it too long soaked in water. Once it absorbs too much fluid it becomes too soggy and soft. If you have this delicious onion at your home, feel free to slightly dilute the buds. Do not allow the plant to bloom too. Make the most out of its rich taste. Zucchini wash and cut into cubes. Chives and onions finely chop. Butter melt and gently fry zucchini. In a frying pan with zucchini add onions and fry briefly until it becomes translucent. Pour hot vegetable soup, season, and cooked for about 15 minutes. Zucchini chop with stick blender or in a blender and add cream and wild onions. Stir and serve hot. Cottage cheese is mashed with a fork, add salt and lemon juice and grated ginger. All together mix in a compact mass. Cut to the correct length so pieces roll in finely chopped chives. Dumplings sprinkle with pepper and garnish with dry cranberries. Whisk the cream and add the cottage cheese, give it a good mix. Add chopped wild garlic and spice. Gently mix with a wooden spoon while adding chunks of goat cheese. When everything unifies well, serve in bowls, decorate the middle with egg and chives. Millet rinse in water and slightly boil in 500 ml of salt water with turmeric. In the pan pour 50 ml of olive oil and three crushed garlic cloves. Cook briefly, then add gourd and carrot chopped into cubes, spice and fry until they evaporate the excess water. When the zucchini and carrot are almost done add the chives and boiled millet and all mix well. On butter fry one crushed garlic clove and add the mushrooms cut into sticks, and season to taste. Form the rice, garnish with minced nuts, roasted mushrooms and chives and pour with little olive oil.